By default, you can automatically protect all your new media files by enabling “Auto-protect New File Uploads” option on Settings page. It comes in useful when you want to protect a lot of new file uploads. However, sometimes you may prefer to protect only certain files during media upload. That’s when you need this file protection on the fly. 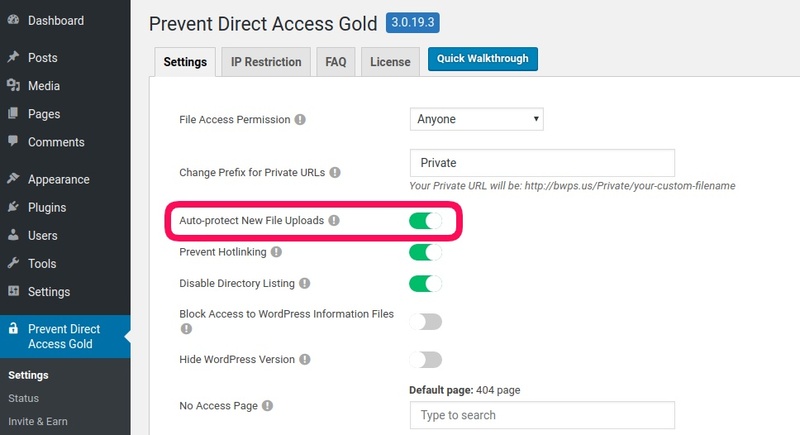 Once Prevent Direct Access (PDA) Gold is activated successfully, you’ll see a checkbox option on “Upload New Media” page as follows. Let’s say, you do not want to protect the next upcoming file uploads, just untick the checkbox. The above “Auto-protect New File Uploads” settings option determines whether this box is checked or not. Put simply, if you enable the auto-protection option on Settings page, the box is checked. Otherwise, it’s unchecked by default. Please note that this checkbox takes higher priority than the auto-protection option. In other words, if you enable “Auto-protect New File Uploads”, but at the same time, untick the box, your newly uploaded files will be unprotected. The checkbox will return checked when you refresh the Upload New Media page. In case your new media files are unprotected, please make sure that the box option is ticked during upload.